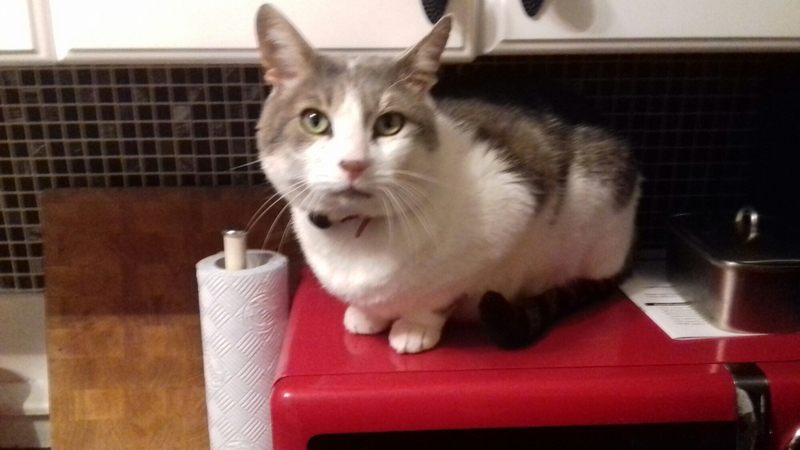 We bought a new cat bed, I mean microwave, in the January sales. We treated ourselves to a new microwave recently – spending a whole £50 on one from Wilko. Microwaves are great when it comes to low-carb diets and cutting down time in the kitchen. You can cook fish fillets in minutes in a microwave. Just remember to cover them up properly or you’ll find it difficult to get rid of the smell. Microwave half a lemon on high for a minute and this will help clean the microwave and banish fishy smells. Cook omelettes the same way. Beat up two to three eggs with a little milk or cream and pour onto a greased side or dinner plate. Cook in 20 and 30-second bursts until cooked. You can also make scrambled eggs, again cooking the eggs in bursts and mixing well in between to break up the big ‘curds’ that develop. Cook them in a greased bowl, for easier cleaning. Another trick is to use the microwave to soften avocados – you know, those ones you bought from the supermarket that promised you they were ready to eat?! Prick the skin all over and microwave on a medium or low setting in 30-second bursts. It should feel softer – if not, give it one more 30-second blast until it is. The microwave can cook you a cupcake – a literal cupcake that it. We’ve got a low-carb recipe for a chocolate version here. And if you want to make our low-carb chocolate fudge, you can soften the ingredients in the microwave for mixing together. For more low-carb microwave ideas, try the Spark People website for meatloaf, bread meatballs, egg custard and more. Do you have any low-carb tips for microwaves? Please feel free to share them here.